Valentines Day is exactly one month away! 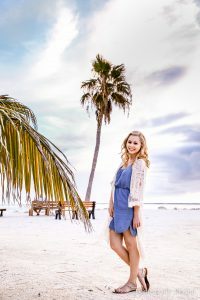 Although not everyone enjoys this hearts and kisses holiday you can’t help but love all of the chocolate and strawberries that are readily available everywhere! 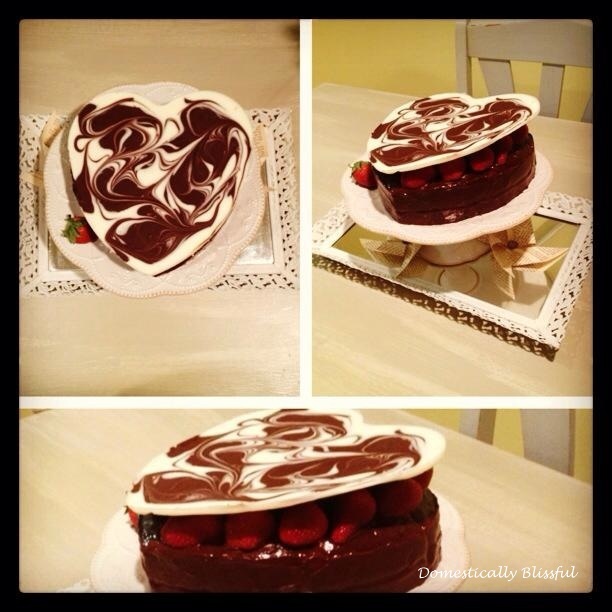 I originally made this cake last Valentine’s Day – our first Valentine’s as a married couple. This heart cake was originally featured in Bon Appetit’s February issue in 1990 entitled Romantic Dining – affiliate link. 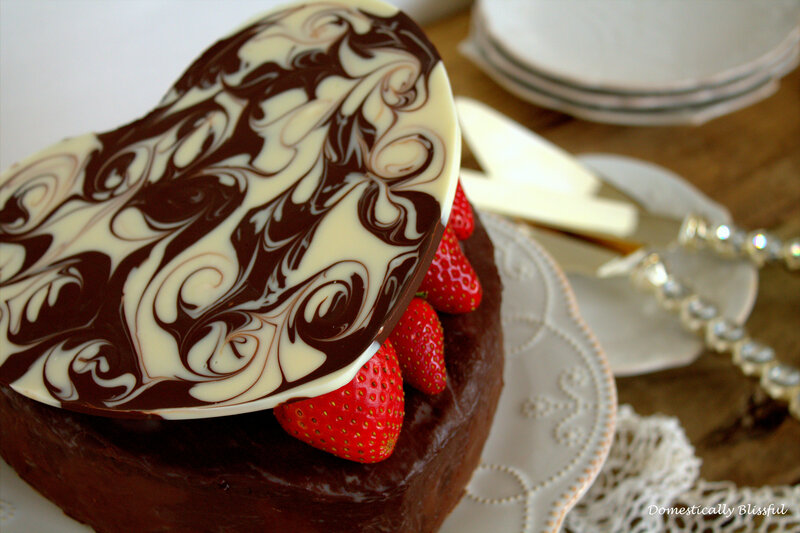 This Romantic Valentine’s Cake is shaped like a heart chocolate box, covered with chocolate ganache, and topped with fresh strawberries. 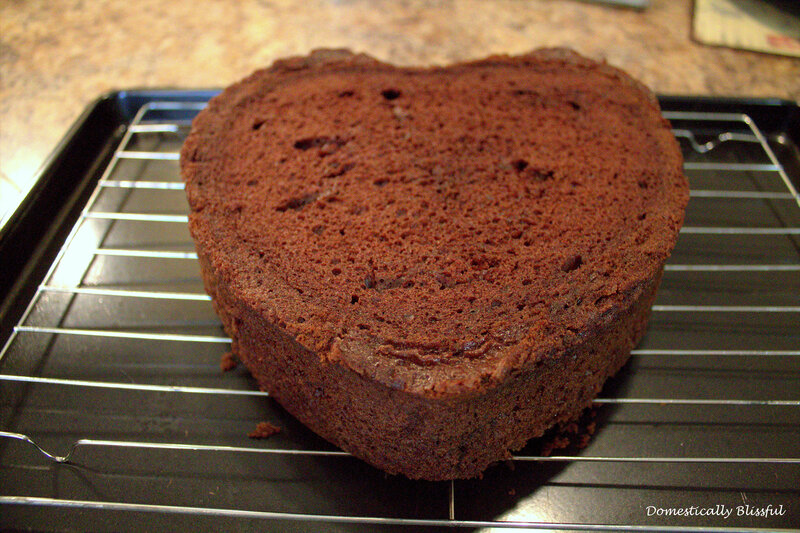 First, make the cake according to the recipe and bake it in a heart shaped cake pan according to the directions. I had some extra cake batter so I also made 5 cupcakes! Once the cake has baked and cooled, remove the cake from the pan and cut off the top so that there is a flat surface. *Last year I cut the cake in half so that there were two heart layers and I spread some cream cheese icing topped with strawberries to the center. Now it’s time to make the ganache! First, bring the ¾ cup of heavy cream to a simmer – almost a boil – then whisk in the 1 cup of dark chocolate chips. Continue to whisk until all of the chocolate chips have melted in and combined with the cream. Remove from the heat and let cool for about 5 minutes or until it is no longer hot and has slightly thickened. Place the cake on a cooling rack on top of a baking sheet and pour the chocolate ganche on top. 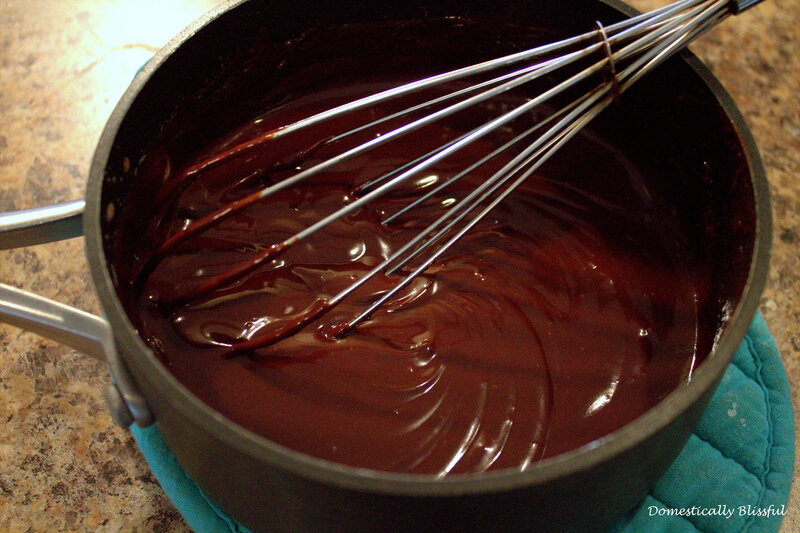 Let the ganache pour over the sides and cover the whole cake, using a spatula to spread the ganache evenly. Let the ganache harden on the cake before the next step. 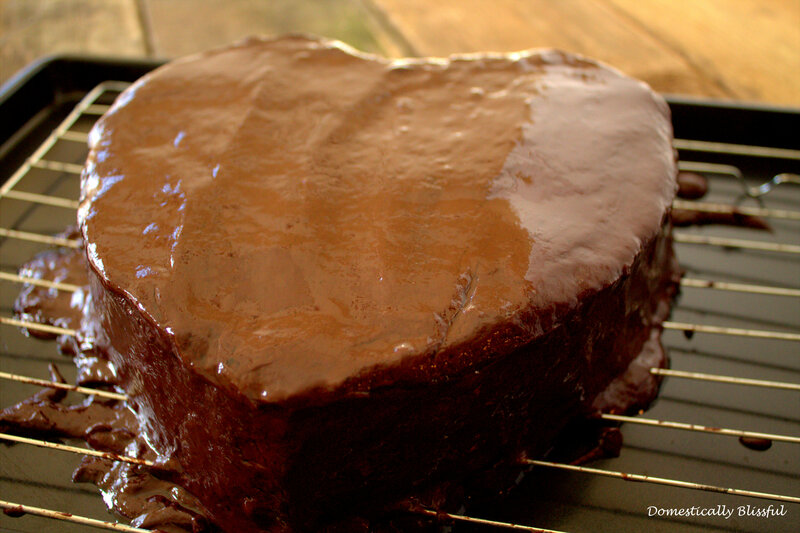 While the ganache is hardening wash and dry the heart shaped cake pan so that you can make the chocolate box top. 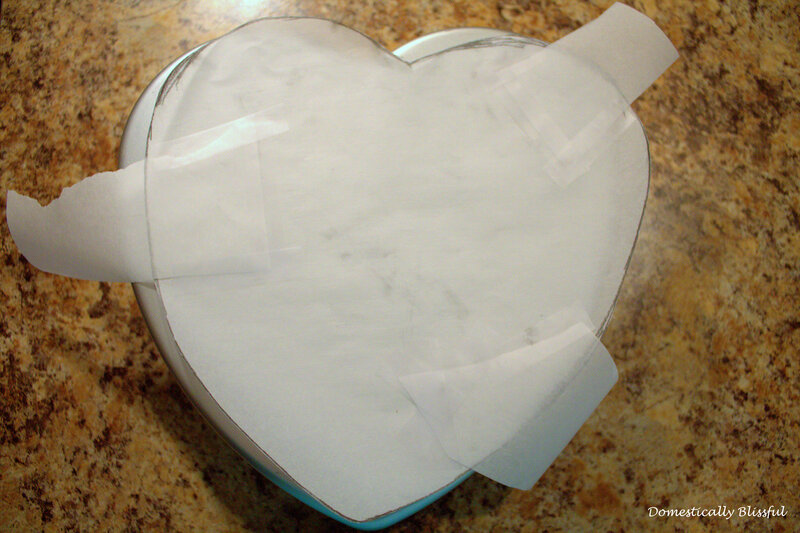 Next, trace the heart shape onto a piece of parchment paper and place it in the cake pan to make sure it fits properly – it doesn’t have to be perfect. Then tape the scrap paper onto the bottom of the heart as tabs so that it will be easier to pull out the hardened swirled chocolate. Melt the chocolate according to the packaging instructions. Using a spoon pour little puddles of the melted dark and white chocolate into the cake pan on top of the heart shaped parchment paper. 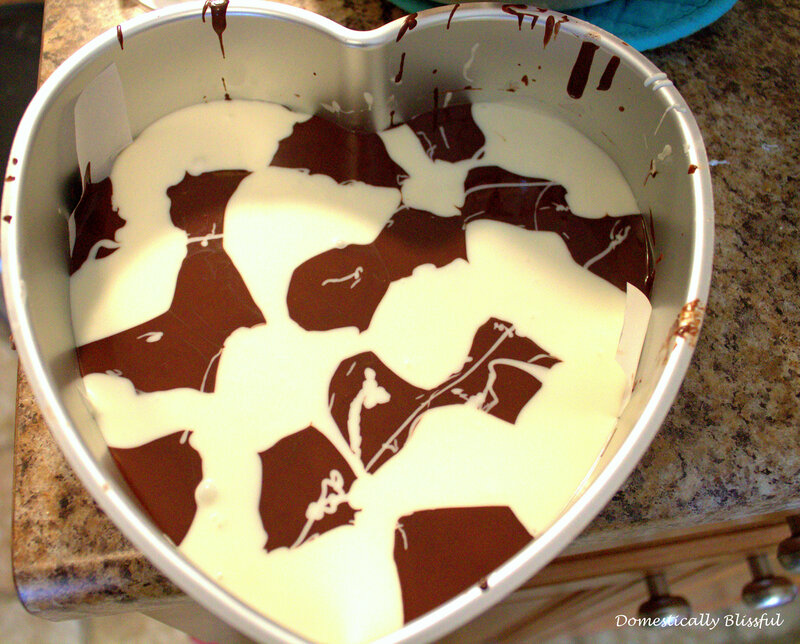 Tap the cake pan on the counter so that the chocolate spreads out evenly in the shape of a heart. Then use a toothpick to swirl the chocolates together. *I have found that the white chocolate melts better in the microwave, so while that is in the microwave I melt the dark chocolate chips in a glass bowl over a pot of boiling water – make sure the water doesn’t tough the bowl! **I have also noticed that the two chocolates swirl better if they are at the same temperature and consistency – this might mean letting the dark chocolate cool for a minute or two before dropping it into the pan. 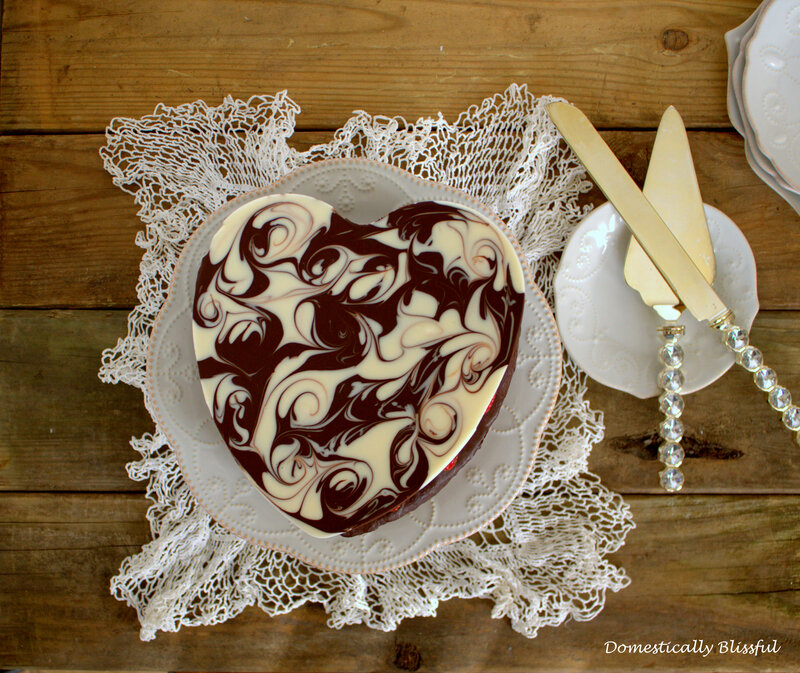 Once you have created your chocolate swirl masterpiece, place the cake pan in the freezer to harden the chocolate. All that’s left is to assemble the cake. 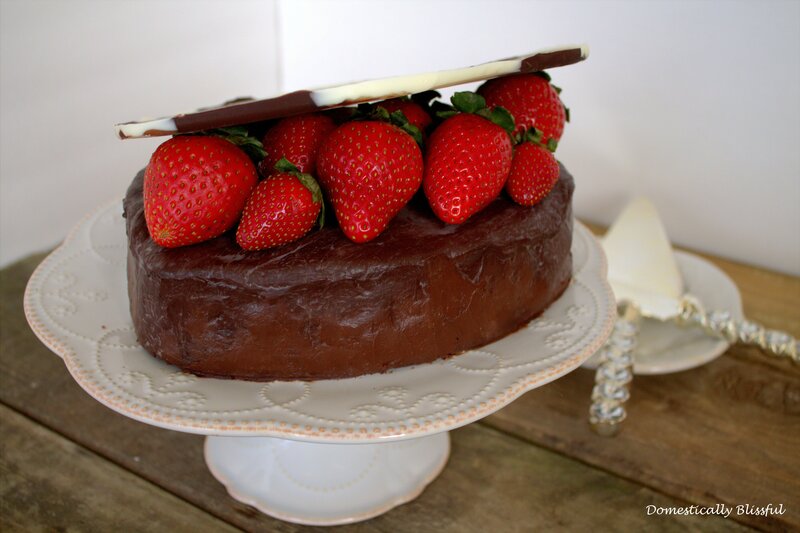 Once the chocolate on the cake and in the heart pan has hardened carefully remove the cake from the cooling rack and place it onto a cake stand using two plastic or metal spatulas. 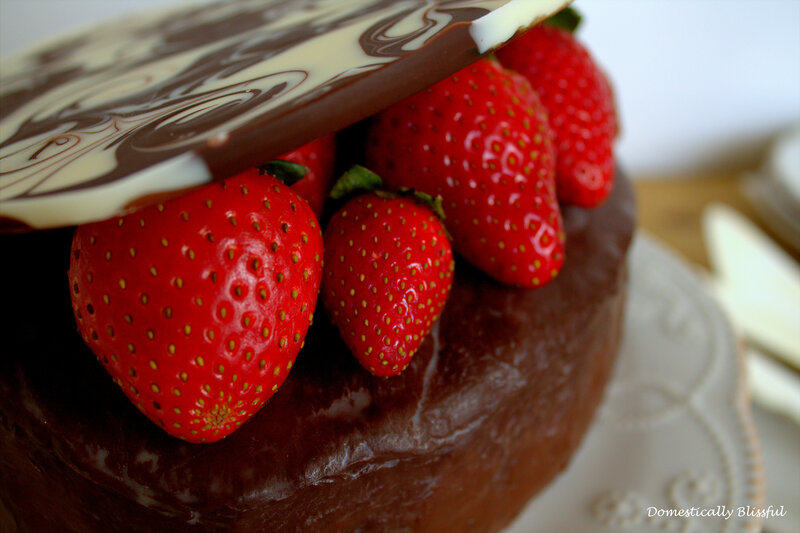 Then place several strawberries – you could use other berries as well – onto one side of the cake. 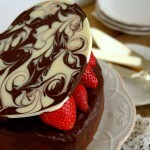 Then carefully remove the swirled heart chocolate from the cake pan and place it on top of the cake and strawberries. Ta-da! Your Romantic Valentines cake is complete! Have fun making – and eating – this Romantic Valentine’s Cake! **I have found that the white chocolate melts better in the microwave, so while that is in the microwave I melt the dark chocolate chips in a glass bowl over a pot of boiling water – make sure the water doesn’t tough the bowl! ***I have also noticed that the two chocolates swirl better if they are at the same temperature and consistency – this might mean letting the dark chocolate cool for a minute or two before dropping it into the pan. Giustina, this is truly a beautiful presentation…lovely…lovely…lovely!